What's that, more Steam keys to give away? You got that right. This time it's a little different, as the steampunk airship first-person shooter Airmen [Steam] has a hidden Linux version on Steam. Airmen is a first person shooter where players build and battle their own custom airships. Start with an empty hangar and build a steampunk airship piece by piece. Crew you airship alongside friends on dangerous expeditions into the archipelago. Fill your cargo hold with wood, aetherium, magnesite and more to upgrade your ship. Mine resources or raid the cargo holds of other players or AI air forts. Take the wheel, mount the turrets, grab an axe for boarding action, or try to stay airborne using a repair hammer but beware: every component of your airship can be destroyed so be sure to extract in one piece. 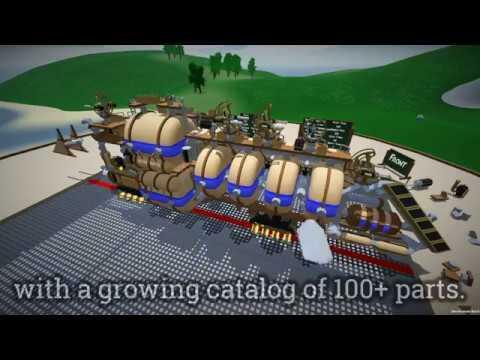 Build your own airship from scratch with a growing catalog of 100+ parts! Join your friends and build an airship together. Equip your ships with cannons, gatling guns, pigeon-guided missiles, rams, harpoons, railguns, and player operated turrets. Battle with up to 8 airships with human or AI pilots. Crew your airship with any number of friends or fly solo against other players in PvP or alongside them in wave based PvE. Board enemies and commandeer their ship using grappling hooks, knives, axes, revolvers, rifles, and boarding charges. We have four Steam keys to give away, so you can help test the Linux version. If you're interested, let yourselves known in the comments. We will aim to give out the keys around 8PM BST on Sunday. If you want to try it anyway, find it on Steam. Not interested in a key. Just commenting to say the game looks cool, different and steampunky-funky. I love just about anything Steampunk, and this sounds like a more in depth version of Guns of Iccarus. Count me in for sure! Looks good, count me in! This could be fun. Please add my name in the hat! Keys sent out, thanks all. Remember to report issues to the developer. First of all: Thanks! First time i "won" a give away ^^. Second: Why is it a "hidden linux version". Do they think its not stable enough to be "Official"? Seems quite fun. And runs fine for me. Only i miss some kind of "Tutorial" Or basics. Or im blind and i missed the Tutorials but i dont think so. EDIT2: Ok nvm my question about hidden linux version. Just found the Thread on Discussions so because he cant Test it himself he dont want to put it "yet" Official on the Store Page.